Rushes of adrenaline are surging through my body. My hands are shaking so hard it’s difficult to type. For the last half hour, I’ve been trying to chase a gathering of moose out of the garden. Whistling and yelling and waving my arms convinced two of them to leave. The remaining two ignored me, continuing to eat the currant bushes with equanimity. To assist their departure, I opened the garden gate, hooting and hollering the whole time. This only motivated the largest moose to charge in my direction. I ran back to the house – and safety – as fast as my legs would carry me. Both moose calmly returned to chomping the currant bushes, working their way unacceptably close to our precious apple tree. I grabbed a baseball bat and headed back into the fray. This time I approached the garden through the woods, whacking trees with the bat and making the scariest noises I could muster. 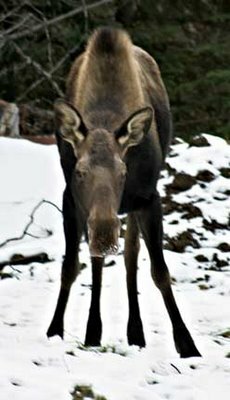 As I neared the garden fence, being careful to stay out of sight and to keep the fence between me and the moose, they finally turned tail and ran, not through the open gate but over the 7-foot fence. Such are the challenges of gardening in Alaska. It’s clear we’ll have to raise the fence to keep out rapacious moose. 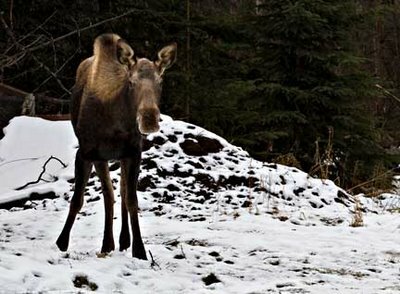 No doubt the moose were in the garden because snow covers the grass on which they normally graze. With temperatures well below freezing, Alaska is settling into winter. Cold weather goes hand in hand with soup. Last night we sat in front of a roaring fire, cozy in our log house, enjoying bowls of ruby-red Beet Soup. Hearty Beet Soup is chockfull of vegetables. Because they cook for a relatively short time, the vegetables retain their individual flavors. They swim in a savory-yet-sweet broth, which is perfectly balanced by the sour cream and fresh dill garnish. Now that I’ve calmed down from my moose encounter, I’m ready for lunch: a delicious bowl of leftover Beet Soup.